The English Crown is one of the oldest surviving governing bodies in the world. Hosted by the erudite, energetic Dr. David Starkey (The Six Wives of Henry VIII), this series tells the epic and bloody stories of Britain's kings and queens from the Saxon era (Alfred the Great) to the early 20th century (Victoria). 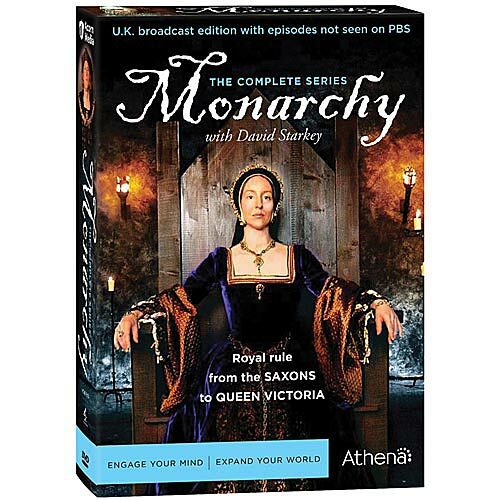 Filmed on location in castles, churches, and battlegrounds, the complete UK broadcast edition includes episodes not seen on PBS. 16 episodes; approx. 13 hours 25 min. on 5 DVDs plus viewer's guide. SDH subtitles. The unique idea of a monarch who is answerable to the people has its roots in early Anglo-Saxon kings such as Alfred the Great, the intellectual warrior who united England. After decades of pounding by Danish invaders intent on "shock and awe," England survives and thrives--but faces a true crisis after Edward the Confessor's death. With a mere 7,000 soldiers, William of Normandy conquers and brutally subjugates a nation of two million, changing England's culture, social structure, and politics forever. Charismatic and hot-tempered, Henry II restores order to his realm by law and by the sword. Later in his line, the Magna Carta curbs and codifies royal power. During "the century of Edwards," the Hammer of the Scots boldly extends his rule over neighboring kingdoms, Edward II loses the crown as a captive of his passions, and Edward III styles himself as a new King Arthur. 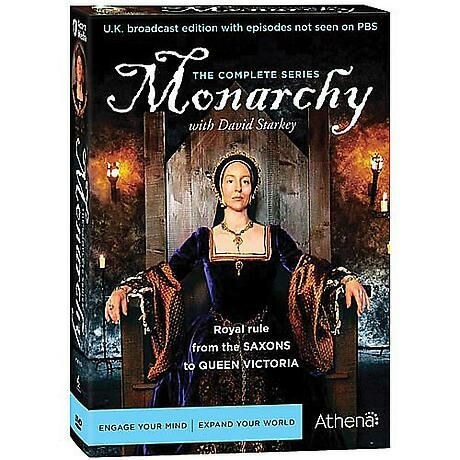 In a kingly conflict dramatized and embellished by Shakespeare, Richard II and his cousin, Henry Bolingbroke, vie for the throne and begin a decades-long struggle that threatens the very basis of the English monarchy. Although Edward IV's coronation seemed to end the War of the Roses, sibling ambitions within the House of York eventually throw the monarchy into turmoil. Henry Tudor forces a dynastic showdown at Bosworth Field and ushers in a new kind of monarchy. In his unquenchable thirst for celebrity and tortuous quest for a male heir, Henry VIII takes the English monarchy to new heights, asserting power over the souls of his subjects as well as their bodies. After six marriages ending in two divorces, two executions, and one bereavement, Henry leaves three children with a clear succession plan for the throne. But Edward, Mary, and Elizabeth soon face their father's real legacy: a volatile fusion of politics and religion. James I takes the throne as the first "king of Great Britain," ruling not only England, but also Scotland and Ireland. But the Stuart reign soon turns from heady triumph to failure and civil war. Under the charismatic Oliver Cromwell, Parliament commits a previously unthinkable act: it executes a reigning king. Eventually, the fledgling republic discovers that it needs a monarch after all. In 1660, amid great pomp and celebration, Charles II returns from exile to assume the throne. With a combination of savvy and strong-arm tactics, he settles an incipient succession crisis and lays the foundation for the world's first modern nation-state. Outraged by James II's ham-handed attempts to promote tolerance for his fellow Catholics, Parliament invites his daughter Mary and her Dutch husband, William of Orange, to invade England and take the throne--ushering in the Glorious Revolution. Under William and Mary and their successor, Anne, the nation transforms itself into Europe's greatest power and enjoys unprecedented financial prosperity. It also assumes a new name to match its new status: Great Britain. George I and his two namesakes forge new relationships with Parliamentary leaders, creating a dynamic that survives in British governance today. But rebellion in the American colonies and bouts of apparent madness bring George III to the brink of abdication. Weathering the anti-royalist storm breaking on the Continent, Great Britain stands strong against the military might of Napoleon. By the mid-19th century, Queen Victoria accedes to the throne, reinventing the British monarchy as a stable yet progressive institution. An honorary fellow at Cambridge University and member of the Royal Antiquaries Society, David Starkey (CBE) has taught history at the London School of Economics, written more than a dozen books, and presented many acclaimed television documentaries.